Create a legally binding Maryland Bill of Sale with our attorney-drafted template! What Is a Maryland Bill of Sale? A Maryland bill of sale is a form that documents the legal exchange of personal property from the seller to the buyer. The purpose of a Maryland bill of sale is to provide a document that proves ownership of an item. Depending on the item being sold, a Maryland bill of sale must be signed in front of a notary. What Are Some Common Bills of Sale Used in Maryland? In Maryland, the most commonly used bills of sale are a general bill of sale, a bill of sale for a motor vehicle, a bill of sale for a boat, and a bill of sale for a gun. How Do I Write a Maryland Bill of Sale? Writing a Maryland bill of sale requires you to have certain information about the individuals involved, the item being sold, and the terms of the sale. 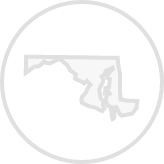 How the item will be described will depend on the type of Maryland bill of sale you're drafting. Maryland bills of sale can be written using plain English, meaning that you don't need to use any hard to understand or confusing legal words. The important part is that you remember to add all of the necessary information for the type of bill of sale you're drafting. First, you'll learn about the information that all Maryland bills of sale need. Then, you'll learn about the specifics related to the most commonly used bills of sale. A Maryland bill of sale should include the date that it is drafted. That's not the only date that should be included. 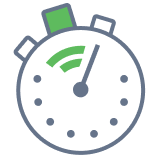 If the buyer will pay for the item on another date, the payment date should be included in the paragraph that discusses compensation. The last date you should include is the date that the buyer and seller sign the bill of sale. However, since some Maryland bills of sale must be signed in front of a notary, it's important that you don't add that date until the notary is present. A Maryland bill of sale needs to include the full legal name, physical address (including the city, state, and zip code), and the driver's license number or state identification number. Please note that it's not a legal requirement for the buyer and the seller to have a valid driver's license or even a state identification card. The purpose of listing this information is to help the buyer or the seller prove that they have the legal right to possess the item. This could be highly beneficial if the item is stolen and law enforcement needs proof as to who owns the item. A Maryland bill of sale must include a description of the item that is being sold. Some bills of sale have specific requirements on how to describe the item. You'll learn more about that soon. Next, you'll include information such as whether the item is being given as a gift, is being paid for via trade, or if there will be an exchange of money. If the item is a trade, the traded item should be described. For monetary compensation, you'll list the amount in words and then in numbers. For example, nine-hundred and eighty-five dollars and zero cents ($985.00). You should include a seller's disclosure. The purpose of a seller's disclosure is to inform the buyer of any known defects in the item. You could also use a buyer's disclosure that states the buyer is aware that the item being purchased has no warranty or guarantee and is being purchased "as-is." A Maryland bill of sale should be signed and dated by both the buyer and the seller. However, it's important to note that a Maryland bill of sale for a motor vehicle or a boat should be signed in front of a notary. A Maryland general bill of sale is used if you want to sell an item such as your iPod, a musical instrument, furniture, or even appliances. In short, it's the bill of sale that you choose if you're not selling a motor vehicle, boat, or a gun. When you're describing the item being sold, you should list a model number, registration number, or serial number (if applicable). You can list the make, model, color, or other descriptors. For example, if you were selling your flat screen television, you would list the manufacturer, the model, and the size. If you're selling something that does qualify as an electronic, you should specify whether you're going to include power cables, remotes, chargers, or other accessories. A Maryland bill of sale for a motor vehicle must include the year, make, model, and body style of the vehicle; the VIN, an odometer reading; and the buyer must explain why they are selling the vehicle for a price that is likely less than the fair market value. A Maryland bill of sale for a motor vehicle must be signed and dated by the buyer and seller in front of a notary. Maryland's Motor Vehicle Administration provides Form VR-181 for the convenience of buyers and sellers. According to Maryland's Department of Natural Resources, a bill of sale for a boat must include the Hull ID, manufacturer, length, and year of the boat. If a motor is included, the bill of sale must document the serial number of the motor, the manufacturer, the model, and the horsepower. The bill of sale should include the registration number or the US Coast Guard documentation number. It must also include the type of boat, hull material, information about the propulsion system, and how the boat is powered. The Department of Natural Resources provides Form B-118 for buyers and sellers. A Maryland bill of sale for a boat should be notarized. A Maryland bill of sale for a gun should detail the make, model, caliber, and serial number. If a trade is involved, the traded item should be clearly documented. Is a Maryland Bill of Sale Required to Register a Vehicle? Yes, a Maryland bill of sale is required to register a vehicle. The registration process takes place at the Motor Vehicle Administration Office. You'll need to complete an Application for Certificate of Title (Form VR-005), your photo identification, proof of insurance, your bill of sale, a certificate of origin or the title, information about the lienholder (if there is one), and a vehicle inspection document. You should also be prepared to pay the tax due and the registration fee. Is a Maryland Bill of Sale Required to Register a Boat? Yes, if the boat was used, you will need a bill of sale. You'll also need to complete Form B-240, have the properly assigned original title, a notarized bill of sale, and an original lien release if there was a previous lien on the boat. The boat registration process takes place through the Department of Natural Resources. You can learn more about the process on their website. Is a Bill of Sale Required to Register a Gun in Maryland? Maryland does have both required and voluntary registration of certain guns. Whether a Maryland bill of sale is required for the process is unclear, but a bill of sale does act as proof of ownership for the weapon. To learn more about the required and voluntary gun registration processes, visit the Maryland State Police website. 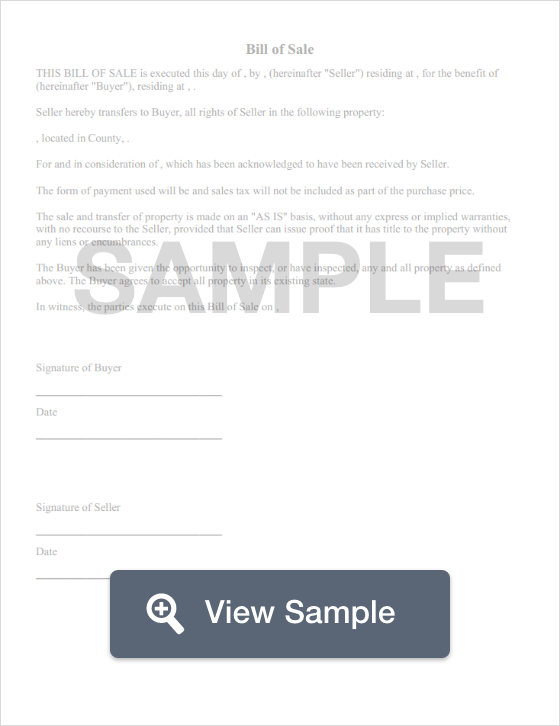 Create a free Maryland Bill of Sale in minutes with our professional document builder.